AntiPolygraph.org News – Page 42 – News about polygraphs, voice stress analyzers, and other purported "lie detectors." 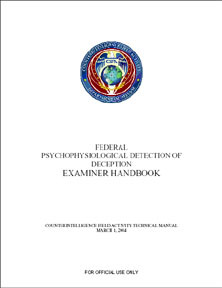 On 11 April 2006, AntiPolygraph.org posted the U.S. federal government’s official polygraph handbook, formally titled the Federal Psychophysiological Detection of Deception Examiner Handbook (1mb PDF) dated 1 March 2004. A discussion of this document is available on the AntiPolygraph.org message board here. In addition, we also made available a Department of Defense Polygraph Institute instructional document dated August 2004 outlining DoDPI’s “Numerical Evaluation Scoring System” (188kb PDF). A discussion of this document is available on the AntiPolygraph.org message board here. After more than five years of manually updating the Polygraph News page on AntiPolygraph.org, we’re moving to a weblog or “blog” format for linking to and commenting on polygraph, voice stress, and other “lie detector” related news. We hope you will enjoy the change. The old polygraph news pages will remain available, but will no longer be updated.